U.S. shale is coming perilously close to puncturing its own rally. 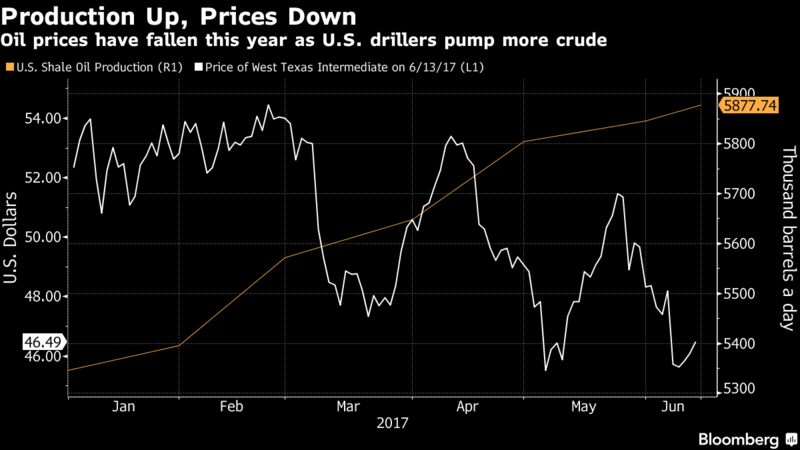 Drillers at an RBC Capital Markets energy conference in New York last week insisted they were sticking with their spending plans, noting they’d emerged from last year’s oil-market slump with leaner costs and lower debt levels. But they acknowledged the shakier ground their budgets stand on. Messages seeking comment from EOG weren’t immediately returned on Tuesday. Reba Reid, a spokeswoman for Noble, confirmed the content of the RBC note. The market got yet another bearish bump Tuesday as West Texas Intermediate oil, the U.S. benchmark, dipped below $46 a barrel on an industry report showing an unexpected boost for U.S. crude stockpiles. Inventories rose by 2.75 million barrels last week, according to an American Petroleum Institute report Tuesday, people familiar with the data said.